Amal Alamuddin’s engagement ring from George Clooney – Wow! Amal Alamuddin’s engagement ring from George Clooney takes glamour to whole new heights. With an ethically mined emerald-cut diamond that weighs in at over seven carats, it also features two side diamond baguettes. The ring looks magnificent on Amal’s finger, whether she’s wearing a gorgeous ensemble during her work as a human rights lawyer or if she’s sporting a trendy pair of torn blue jeans. Like Amal Alamuddin’s engagement ring, this amazing emerald-cut diamond ring from Brilliance is flanked by a pair of gleaming baguettes for a look that is as elegant as Amal and George themselves. The emerald cut allows the center diamond to take the spotlight, while the baguettes bring additional sparkle to the overall presentation. This ring features a platinum setting, but looks beautiful in white, yellow, or rose gold as well. Born in Beirut, Lebanon, on February 3rd of 1978, Amal Alamuddin is a London-based activist, author, and human rights lawyer. The beautiful barrister specializes in international law, criminal law, extradition, and human rights. Amal was born just before the Lebanese Civil War reached its height, and in the 80s, when the conflict was in full swing, the Alamuddin family moved to London. As a child, Alamuddin attended Dr. Challoner’s High School, which is a girls’ grammar school located in the Little Chalfont region of Buckinghamshire. She went on to study at St. Hugh’s College in Oxford, receiving an Exhibition scholarship and the coveted Shrigley Award while there. In 2000, Amal graduated with a Bachelor of Arts in Jurisprudence, which is Oxford’s equivalent to the LLB. In 2001, Amal entered the New York University School of Law in order to study for the Master of Laws degree, working as a clerk for the clerkships program ant eh International Court of Justice while she was there. During her time at NYU, Alamuddin received the Jack J. Katz Memorial Award for excellence in Entertainment Law. After her graduation, Amal worked at the Sullivan & Cromwell firm in New York City for three years, after which she went on to work in the Office of the Prosecutor at the UN Special Tribunal for Lebanon as well as at the International Criminal Tribunal for the former Yugoslavia. She has been involved in a number of high-profile cases, standing as a representative for the state of Cambodia, Julian Asssange of WikiLeaks fame, Yulia Tymoshenko, and former Libyan intelligence chief Abdallah Al Senussi. Alamuddin is also an adviser to the King of Bahrain in connection with the Bahrain Independent Commission of Inquiry headed by Professor M. Cherif Bassiouni. Amal returned to the UK in 2010. Since then, she has served as a barrister in London at Doughty Street Chambers. In 2015, she began working on the recognition of the Armenian Genocide, representing Armenia on behalf of Doughty Street Chambers. Did you know that Amal Alamuddin is fluent in three languages? She speaks English, French, and Arabic. Amal Alamuddin and George Clooney dated for about six months before announcing their engagement in April of 2014. The couple obtained marriage licenses on August 7th of the same year, and married on September 27th of 2014 at the grand city hall in Venice, Italy. The couple enjoy their life in England, where Amal continues her important work. What Our Experts Have to Say about Amal Alamuddin’s Engagement Ring. There are quite a few celebrity engagement rings about which very little is known. Amal Alamuddin’s engagement ring is not one of them! The ethically-mined, seven carat diamond at its center is rare and beautiful, and its setting, which includes platinum and side baguettes, sets it off perfectly. According to E! News, the ring’s price tag was in the $750,000.00 range. 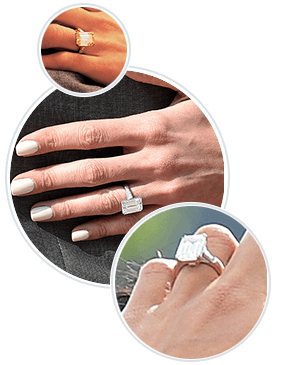 Although Amal’s engagement ring is a knockout, the overall look is an attainable one, particularly when you work with the experts at Brilliance. Take advantage of the online custom-design tools and feel free to have a chat with a customer service representative, and don’t hesitate to add your own personal touches when working to design a beautiful ring based on the one Amal Alamuddin and George Clooney chose to celebrate their engagement. With the diamond experts at Brilliance on your side, you’ll find it’s surprisingly simple to create the perfect look to suit your style while expressing the love that’s yours alone.